Is this signal of things to come for the Obama Administration? 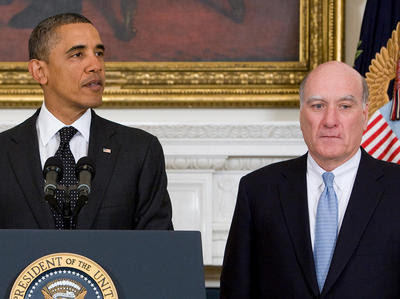 Chief of Staff William Daley has stepped down and the more liberal Jack Lew will be taking over in his place. In an effort to reach out to the business community, Obama named Daley as his new Chief of Staff once Rahm Emanuel decided to run for mayor of Chicago. Daley as the former vice chairman of JP Morgan Chase carried very strong business ties to the business community. He is also more of a centrist Democrat to the chagrin of many libearl democrats. Bill Daley tells ABC News that he resigned last week as chief of staff, as first reported by the Los Angeles Times. Senior administration officials confirm that Jacob “Jack” Lew, the current director of the Office of Management and Budget, will be the new chief of staff. Daley was brought in to replace Rahm Emanuel, but in November his role was “changed,” with more power given to senior adviser Pete Rouse. At the time White House officials insisted the move was in no way a demotion, but it certainly wasn’t a vote of confidence.